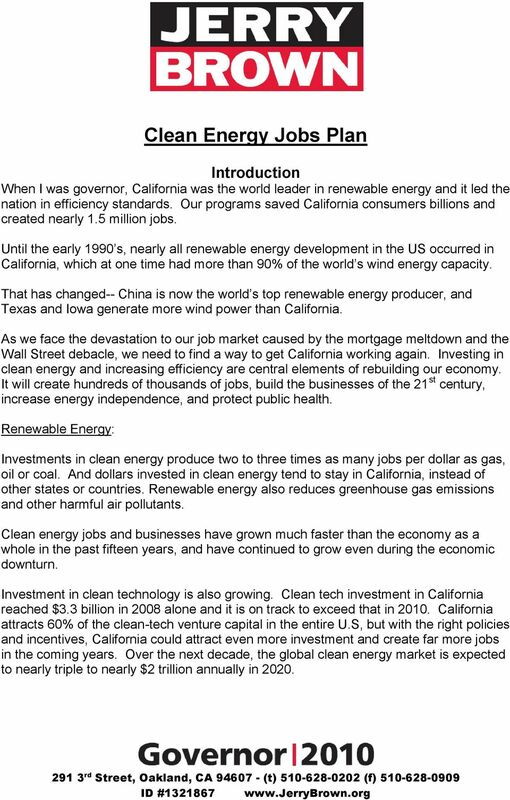 Download "Clean Energy Jobs Plan"
1 Clean Energy Jobs Plan Introduction When I was governor, California was the world leader in renewable energy and it led the nation in efficiency standards. Our programs saved California consumers billions and created nearly 1.5 million jobs. Until the early 1990 s, nearly all renewable energy development in the US occurred in California, which at one time had more than 90% of the world s wind energy capacity. That has changed-- China is now the world s top renewable energy producer, and Texas and Iowa generate more wind power than California. As we face the devastation to our job market caused by the mortgage meltdown and the Wall Street debacle, we need to find a way to get California working again. Investing in clean energy and increasing efficiency are central elements of rebuilding our economy. It will create hundreds of thousands of jobs, build the businesses of the 21 st century, increase energy independence, and protect public health. Renewable Energy: Investments in clean energy produce two to three times as many jobs per dollar as gas, oil or coal. And dollars invested in clean energy tend to stay in California, instead of other states or countries. Renewable energy also reduces greenhouse gas emissions and other harmful air pollutants. Clean energy jobs and businesses have grown much faster than the economy as a whole in the past fifteen years, and have continued to grow even during the economic downturn. Investment in clean technology is also growing. Clean tech investment in California reached $3.3 billion in 2008 alone and it is on track to exceed that in California attracts 60% of the clean-tech venture capital in the entire U.S, but with the right policies and incentives, California could attract even more investment and create far more jobs in the coming years. Over the next decade, the global clean energy market is expected to nearly triple to nearly $2 trillion annually in 2020. 2 Efficiency: Energy efficiency is the cheapest, fastest, and most reliable way to create jobs, save consumers money and cut pollution from the power sector. It is by far cheaper than the cheapest source of energy and has no negative impact on the environment. California has led the nation in efficiency standards and programs. 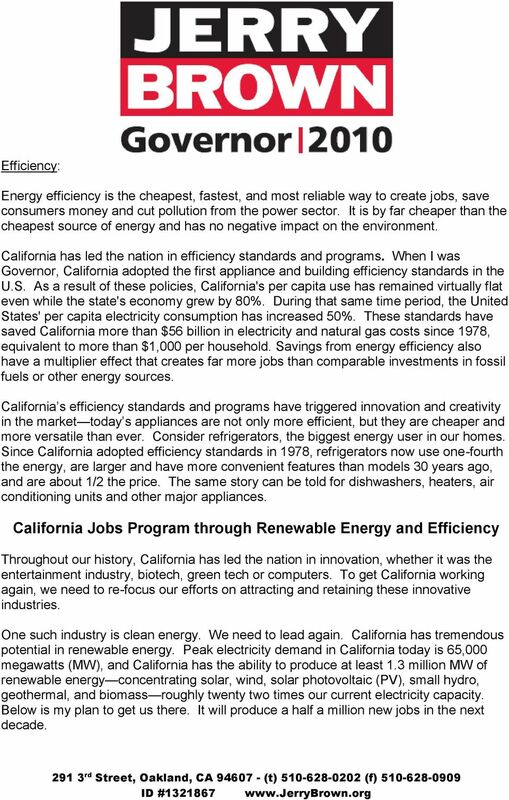 When I was Governor, California adopted the first appliance and building efficiency standards in the U.S. As a result of these policies, California's per capita use has remained virtually flat even while the state's economy grew by 80%. During that same time period, the United States' per capita electricity consumption has increased 50%. These standards have saved California more than $56 billion in electricity and natural gas costs since 1978, equivalent to more than $1,000 per household. Savings from energy efficiency also have a multiplier effect that creates far more jobs than comparable investments in fossil fuels or other energy sources. California s efficiency standards and programs have triggered innovation and creativity in the market today s appliances are not only more efficient, but they are cheaper and more versatile than ever. Consider refrigerators, the biggest energy user in our homes. Since California adopted efficiency standards in 1978, refrigerators now use one-fourth the energy, are larger and have more convenient features than models 30 years ago, and are about 1/2 the price. The same story can be told for dishwashers, heaters, air conditioning units and other major appliances. California Jobs Program through Renewable Energy and Efficiency Throughout our history, California has led the nation in innovation, whether it was the entertainment industry, biotech, green tech or computers. To get California working again, we need to re-focus our efforts on attracting and retaining these innovative industries. One such industry is clean energy. We need to lead again. California has tremendous potential in renewable energy. Peak electricity demand in California today is 65,000 megawatts (MW), and California has the ability to produce at least 1.3 million MW of renewable energy concentrating solar, wind, solar photovoltaic (PV), small hydro, geothermal, and biomass roughly twenty two times our current electricity capacity. Below is my plan to get us there. It will produce a half a million new jobs in the next decade. 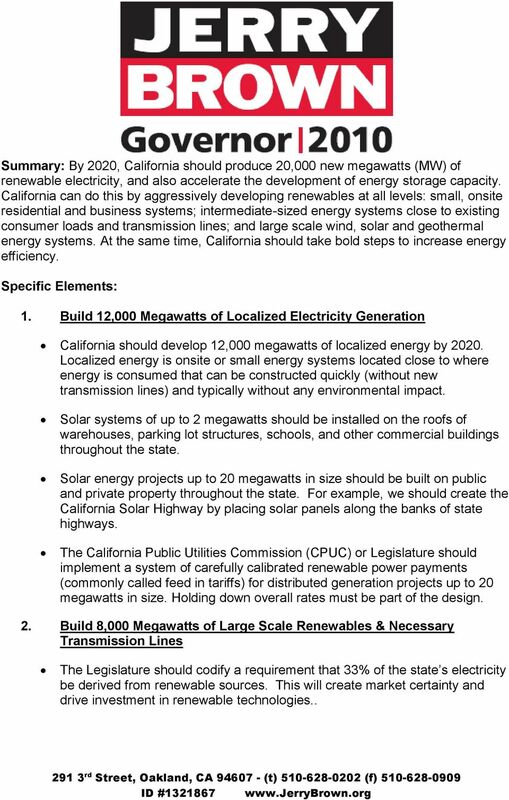 3 Summary: By 2020, California should produce 20,000 new megawatts (MW) of renewable electricity, and also accelerate the development of energy storage capacity. California can do this by aggressively developing renewables at all levels: small, onsite residential and business systems; intermediate-sized energy systems close to existing consumer loads and transmission lines; and large scale wind, solar and geothermal energy systems. At the same time, California should take bold steps to increase energy efficiency. Specific Elements: 1. Build 12,000 Megawatts of Localized Electricity Generation California should develop 12,000 megawatts of localized energy by Localized energy is onsite or small energy systems located close to where energy is consumed that can be constructed quickly (without new transmission lines) and typically without any environmental impact. Solar systems of up to 2 megawatts should be installed on the roofs of warehouses, parking lot structures, schools, and other commercial buildings throughout the state. Solar energy projects up to 20 megawatts in size should be built on public and private property throughout the state. For example, we should create the California Solar Highway by placing solar panels along the banks of state highways. The California Public Utilities Commission (CPUC) or Legislature should implement a system of carefully calibrated renewable power payments (commonly called feed in tariffs) for distributed generation projects up to 20 megawatts in size. Holding down overall rates must be part of the design. 2. Build 8,000 Megawatts of Large Scale Renewables & Necessary Transmission Lines The Legislature should codify a requirement that 33% of the state s electricity be derived from renewable sources. 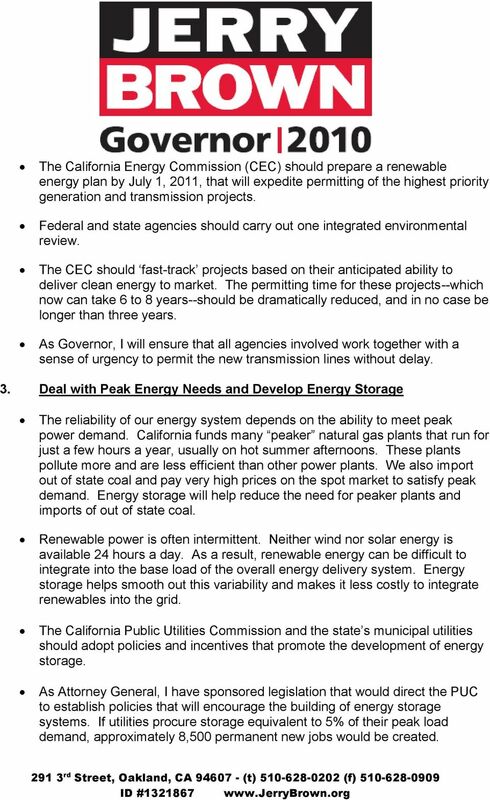 This will create market certainty and drive investment in renewable technologies..
4 The California Energy Commission (CEC) should prepare a renewable energy plan by July 1, 2011, that will expedite permitting of the highest priority generation and transmission projects. Federal and state agencies should carry out one integrated environmental review. The CEC should fast-track projects based on their anticipated ability to deliver clean energy to market. The permitting time for these projects--which now can take 6 to 8 years--should be dramatically reduced, and in no case be longer than three years. As Governor, I will ensure that all agencies involved work together with a sense of urgency to permit the new transmission lines without delay. 3. Deal with Peak Energy Needs and Develop Energy Storage The reliability of our energy system depends on the ability to meet peak power demand. California funds many peaker natural gas plants that run for just a few hours a year, usually on hot summer afternoons. These plants pollute more and are less efficient than other power plants. We also import out of state coal and pay very high prices on the spot market to satisfy peak demand. Energy storage will help reduce the need for peaker plants and imports of out of state coal. Renewable power is often intermittent. Neither wind nor solar energy is available 24 hours a day. As a result, renewable energy can be difficult to integrate into the base load of the overall energy delivery system. Energy storage helps smooth out this variability and makes it less costly to integrate renewables into the grid. The California Public Utilities Commission and the state s municipal utilities should adopt policies and incentives that promote the development of energy storage. As Attorney General, I have sponsored legislation that would direct the PUC to establish policies that will encourage the building of energy storage systems. If utilities procure storage equivalent to 5% of their peak load demand, approximately 8,500 permanent new jobs would be created. 5 4. Create New Efficiency Standards for New Buildings A typical home uses much more energy than it needs to operate economically. New buildings can be designed today to use 1/3 to 1/2 less energy than they use today, with little or no cost increase. We should establish a plan and a timeline to make new homes and commercial buildings in California zero net energy highly efficient structures that use onsite renewable energy for all their electricity and natural gas needs. 5. 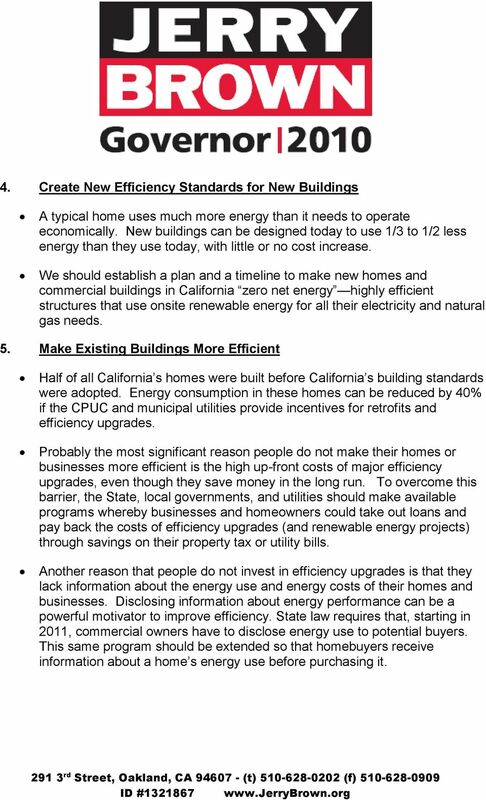 Make Existing Buildings More Efficient Half of all California s homes were built before California s building standards were adopted. Energy consumption in these homes can be reduced by 40% if the CPUC and municipal utilities provide incentives for retrofits and efficiency upgrades. Probably the most significant reason people do not make their homes or businesses more efficient is the high up-front costs of major efficiency upgrades, even though they save money in the long run. To overcome this barrier, the State, local governments, and utilities should make available programs whereby businesses and homeowners could take out loans and pay back the costs of efficiency upgrades (and renewable energy projects) through savings on their property tax or utility bills. Another reason that people do not invest in efficiency upgrades is that they lack information about the energy use and energy costs of their homes and businesses. Disclosing information about energy performance can be a powerful motivator to improve efficiency. State law requires that, starting in 2011, commercial owners have to disclose energy use to potential buyers. This same program should be extended so that homebuyers receive information about a home s energy use before purchasing it. 6 6. Adopt Stronger Appliance Efficiency Standards The CEC should adopt stronger appliance standards for lighting, consumer electronics and other products. Federal law should be changed to make it easier for California to adopt standards more stringent than federal standards, as we have authority to do for automobile emission standards. 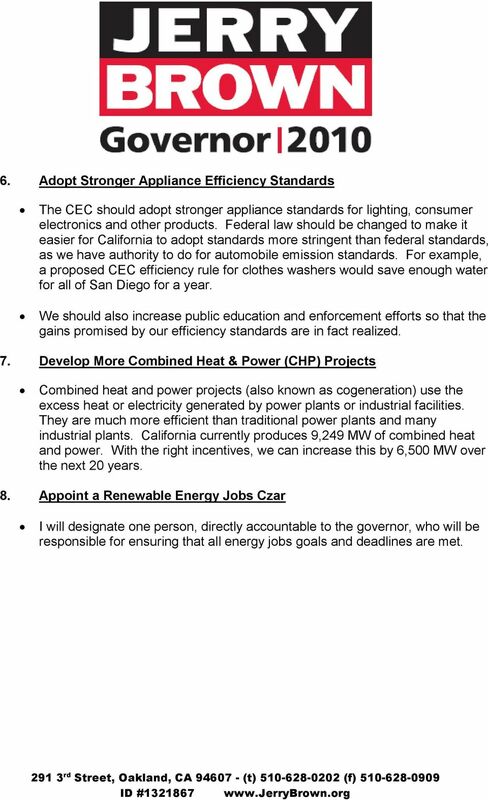 For example, a proposed CEC efficiency rule for clothes washers would save enough water for all of San Diego for a year. We should also increase public education and enforcement efforts so that the gains promised by our efficiency standards are in fact realized. 7. Develop More Combined Heat & Power (CHP) Projects Combined heat and power projects (also known as cogeneration) use the excess heat or electricity generated by power plants or industrial facilities. They are much more efficient than traditional power plants and many industrial plants. California currently produces 9,249 MW of combined heat and power. With the right incentives, we can increase this by 6,500 MW over the next 20 years. 8. 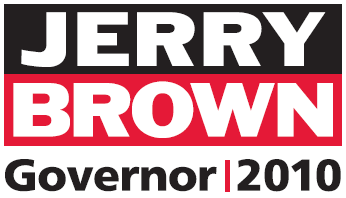 Appoint a Renewable Energy Jobs Czar I will designate one person, directly accountable to the governor, who will be responsible for ensuring that all energy jobs goals and deadlines are met. THE ECONOMIC CASE for CLEAN ENERGY by NextGen Climate In order to address climate change, we must find common sense, economical solutions to reduce carbon pollution by building a clean energy economy. Charles Budney English 138T Friday, April 5, 2013 Texas Wind: The New Oil The earth is slowly, but surely, exhausting its resources. Fossil Fuels like coal and petroleum are undeniably a finite resource. Invite you to enter Global Clean Tech Open IDEAS Competition Making the world clean and green, one idea at a time. Edison Electric Institute National Key Accounts Workshop March 19, 2012 Michael R. Niggli, SDG&E President & COO 2012 San Diego Gas & Electric Company. Trademarks are property of their respective owners.